As the Iway project moves along, RIDOT and the city are looking at the rebuilt street grid below where the highway now stands. While the rebuilding of the grid may seem to be a simple project of reconnected streets that were removed by the highway, there many issues to consider. The City held two meetings recently to give the public an opportunity to view and comment on the plans. We will be looking at some areas of concern that we have for the proposed grid here at Greater City: Providence. We start off on the east side of the Providence River looking at the Wickenden Street area and looking at an alternate plan proposed by Landscape Architect Ron Henderson of L+A Landscape Architecture of Providence. First let’s look at RIDOT’s proposal. Download .jpeg of expanded view of RIDOT plans. The chief concern with the RIDOT proposal, is the emphasis on moving vehicular traffic. While this is a primary access for the city to and from the relocated Route 195, we need make drivers coming off the highway aware that they are now on city streets and change the drivers’ behavior from highway driving, to city driving. The green dashed line and arrow shows where traffic from 195 West (from East Providence) exits the highway and accesses the surface streets via a new South Main Street extension. Traffic from the highway merges with local traffic from the far side of the Iway and approaches Wickenden at a traffic light. Though the highway ramp is one lane at the point where it leaves the highway, by the time it reaches Wickenden Street, it is four lanes wide. Why does a one-lane ramp coming off of a four-lane Interstate highway need to enlarge out to four-lanes? This arrangement brings to mind the intersection of Memorial Boulevard and Francis Street at the mall. Due to the configuration of the ramp, the first place where traffic coming off the highway is forced to slow down is at the light at Wickenden. Traffic that makes the green light at Wickenden is free to speed the length of South Main, the next traffic light is not until College Street. The speed of traffic coming off the highway and the number of lanes at this intersection will intimidate pedestrians trying to walk on Wickenden Street. Ron’s plan for this area reduces the number of lanes from 4 to 3. He also proposes making the parcels east of the South Main Street extension (between it and the current Benefit Street gas station) open to development (the RIDOT plan proposes this as a small park, more on that later). Having buildings on both sides of this street gives it a city feel, conveying to drivers the message that they are no longer on the highway and are now in the city and that they need to slow down. One of the big questions that came from the public meeting was, “where do we want the highway to end?” With the ramp merging into South Main Street, the highway does not practically end until the traffic light at Wickenden. An idea to investigate, is ending the ramp at a right angle with a traffic light at South Main. If the ramp were to be lined up with Tockwotton Street with a traffic light, traffic coming of the highway would have to slow or stop to turn right onto South Main Street. There would then be two blocks between where the highway effectively ends and Wickenden Street. Traffic would be normalized to city driving conditions. A concern with this type of arrangement would be the tendency for traffic to stack back onto the highway. It would seem there is plenty of room along this section of Route 195 for the ramp to sufficiently handle the stacking. See the Atwells Avenue ramp from Route 95 southbound for an example of how a high traffic ramp can function with a light at the end of it. Currently traffic coming down South Water Street or across the Point Street Bridge, is sent along the extension of South Water Street (on current maps, this is now called South Main Street, RIDOT plans to change the names of the streets south of Wickenden so they match each other on both sides). Traffic continues along South Water Street, under the Iway, and hangs a sharp left onto the ramp to 195 (traffic may also continue straight to India Street and India Point Park). Currently heading eastbound off the Point Street Bridge, there are two lanes for heading toward Wickenden Street, and two outboard lanes to turn onto South Water Street and towards Route 195 or to continue straight to the Benefit Street jug-handle. In the RIDOT plan, these outboard lanes remain for traffic heading to Route 195 (the jug-handle lanes go away though). The angle of these outboard lanes allows traffic to move swiftly (read: fast) from Point Street, sliding onto South Water Street and onto Route 195. Ron’s plan eliminates these outboard lanes as they are not at all pedestrian friendly. The current configuration of traffic coming off the Point Street Bridge remains almost unchanged, anyone who has ever tried to walk through this area knows how disappointing that is. Looking at the RIDOT plan, there are still 3 sets of crosswalks for pedestrians to cross, traffic is funneled in such a way that allows it to maintain high speeds (remember, the city speed limit is actually 25 miles per hour). Eliminating the outboard lanes and pulling the remaining eastbound lanes in closer to the westbound lanes reduces the overall width of the street allowing for pedestrians to have a much smaller gap to cross. This also opens up the land where the outboard lanes currently are to development. Further extending the Wickenden Street streetwall towards the water and enforcing the impression that these are city streets. Another fault in the RIDOT plan, is that pedestrians in the new Eastside Park (along the river at South Water Street) who want to continue walking along the river toward the Hot Club and the Hurricane Barrier, need to walk up to the South Water Street intersection to cross, then back down to the river. Again, anyone who walks in this area now, knows how dangerous and annoying it is to navigate this area on foot. Reducing the number of lanes allows for a crosswalk closer to the river so that pedestrians may enjoy the riverfront uninterrupted. The Wickenden Street we all know and love is a narrow two-lane street. The Point Street Bridge is a three-lane road (currently striped with 2 lanes heading eastbound). Currently between Wickenden and the bridge we have the massive hulk of Route 195 and a tangle of traffic heading to and from Route 195. Many of us are looking forward to getting Wickenden Street back when the highway goes, and being able to walk safely and comfortably from Wickenden to Point Street and Davol Square. The potential for the Davol area and all of the Jewelry District to capitalize on the success of Wickenden Street is huge. Imagine a future visiting the Heritage Harbor or the Children’s Museum on the west side of the Providence River, and strolling across the Point Street Bridge to grab a drink at the Hot Club or some coffee at the Coffee Exchange, then visiting all the antique shops and galleries on Wickenden Street. Nice thought isn’t it? Well, RIDOT’s proposals sees Wickenden as a five-lane road between South Main and South Water with a 30-foot traffic island (maintained by who exactly? ), then four-lanes between South Main and Traverse Street, before cramming all those lanes into the two-lane sections of Wickenden. Wickenden need be no wider than four-lanes in the section between South Main and South Water. And the giant traffic island is simply not needed. Reducing the number of lanes and the width of the traffic island frees up land for development under what is now Route 195. A traffic island wide enough to simply be a pedestrian refuge will suffice. A left turn lane (the 5th lane) from Point Street eastbound to South Main Street is simply not needed for the volume of traffic that would conceivably be making that turn. Reducing the overall width of this area of Wickenden also allows for room for on-street parking. On-street parking slows traffic traveling on the street, is a safety barrier between pedestrians on the sidewalk and the street, and will also be important for future retail development in this area. Reducing lanes, reducing overall width of the street, pulling in the street edge to allow buildings to be closer to each other across the street are all physical queues to drivers that they are in the city. Those who attended the public meeting on this may have heard my brain explode when the representative from RIDOT mentioned that a lot of traffic uses the current South Main Street exit to reach the hospitals and that they expect many people to continue that in the future. Even though a ramp specific for the hospitals is being built off the end of Route 195 before it merges with Route 95 south. Building in capacity to make allowances for drivers’ bad habits is a sure fire way to ensure that they continue with those bad habits. If there is a degree of congestion at this ramp guess what, those hospital bound folks will learn quick that the new ramp built just for them really is the best way to go. Hell, I’d go so far as putting up a sign on Route 195 telling people what exit they should take for the hospital (and that sign would not suggest South Main Street). The same goes for getting on Route 195. When I worked in Davol Square I would watch the hospital traffic using Eddy to Point to get to 195 (we called it, Route 195A). When the highway was routed through Downtown, it often did make more sense to use the Point Street Bridge as a by-pass. Now that the highway is south of Point Street, much of that traffic is better off heading to Thurbers to get on the Iway directly. If the capacity to handle traffic at Wickenden is better, and the access from Eddy to Allens to Thurbers is not clear and direct, then people will continue to use Point Street. Looking at the RIDOT plan, there is a pink line cutting across the plan. This line is the proposed bike access from the Washington Bridge/East Bay Bike Path to the bikeway along South Water Street. Bikes would cross the India Point Park Pedestrian Bridge to George Cohan Boulevard and follow that to a new bike path which is the pink line we see coming in from the right side of the plan. This path ends at a little pocket park approximately across from Benefit Street at Wickenden Street. In the center of the circle would be the war memorial that currently exists at this location. Following the pink line cyclists would dismount their bikes to cross the South Main Street onramp on foot, then cross the eastbound lanes of Wickenden, walk along the traffic island, cross the westbound lanes of Wickenden, then cross South Water Street before reaching the bikeway in the new park. Got that? In my opinion, the formal route of the bike path, should remain in India Point Park and across to Fox’s Point, then use bike lanes on South Water and India Streets to reach the bikeways north of Wickenden Street. I think people want the recreation paths to be as close to the water as possible wherever possible. Cyclists who utilize the India Point Park Bridge can use local streets to reach their destinations and should need the special path along George Cohan Boulevard. So the park? As proposed, it sits between a gas station and a highway ramp. We will be building a large new park along the river at the corner of South Water and Point Street, we have waterfront walkways down near the Hurricane Barrier, we have the whole of India Point Park… Why should we invest in another small space that has little use? As said above, putting buildings here reinforces that this is a city street, and helps build the Wickenden Street environment down towards the waterfront. I think many of us think that Wickenden Street is some sort of end, there’s Wickenden Street and then the highway. In reality, there is a bit of a neighborhood between Wickenden and the highway, and the potential to expand it a touch when the highway is gone. 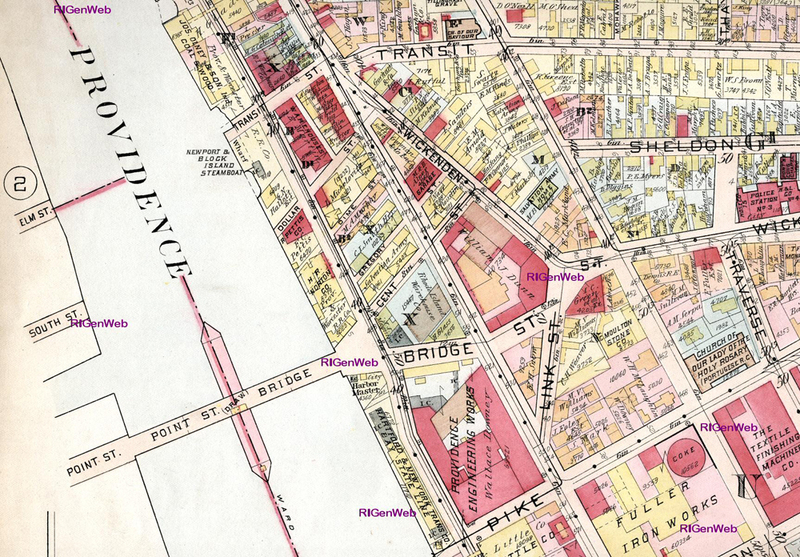 Pike Street historically ran east to west south of Wickenden Street from the waterfront to Brook Street. Much of it was removed for the construction of the highway, the only bit of it remaining currently runs from Brook Street to Traverse Street, then loops around the church where it connects to Benefit Street. 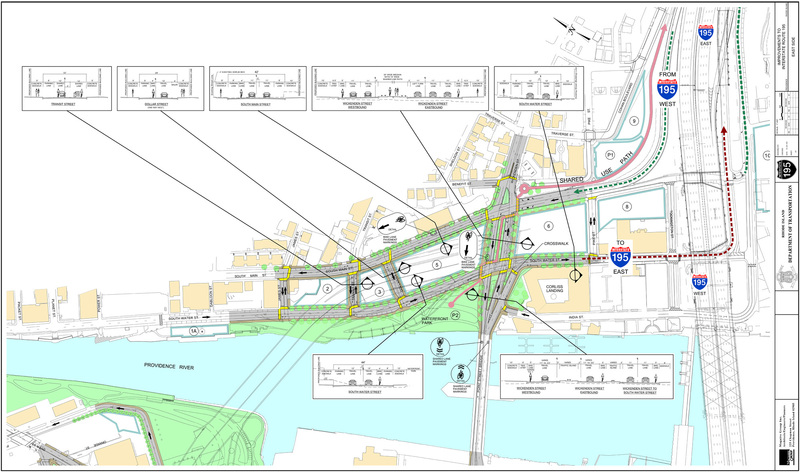 The RIDOT plan would restore a disconnected portion of Pike Street between the new South Main Street extension and South Water Street (currently South Main Street (I know that is confusing)). If, as proposed above, the ramp from Route 195 westbound ended at Tockwotton Street, instead of merging into South Main Street, Pike Street could be restored all the way through to where it exists now. This would make a new east west street between Wickenden and the Iway. The historic section of Pike Street between future South Water Street and future India Street is currently a surface parking lot, so there is the potential to restore all of Pike Street’s historic length. [Define] “complete streets principles” as federal, state, local, or regional level transportation laws, policies, or principles which ensure that the safety and convenience of all users of a transportation system, including pedestrians, bicyclists, public transit users, children, older individuals, motorists, and individuals with disabilities, are accommodated in all phases of project planning and development. This legislation is co-sponsored by Rhode Island Senator Sheldon Whitehouse (good one Sheldon!). While “Complete Streets” is not yet law, we should get out ahead of this legislation in planning for the future 195 land and our city’s connections to the relocated Route 195. The Project for Public Spaces has a timely post, The Myth of the Great Wide Way, debunking the myth that wider roads are safer roads. [Robert Nolan ] further discovered that widening lanes or increasing capacity – conventionally expected to improve safety – actually increases speeds and compromises safety. The primary reason for this is that wider streets with fewer roadside objects create a false sense of security, and drivers may not recognize risky situations as readily due to a decrease in the difficulty of the driving task. Building for the convenience of the driver and adding in pedestrian and cyclist infrastructure to that driver convenience is not the way we should be going. These new city streets and their connections to the highways must account for all users equally from the start to ensure the safety and convenience of all users of the roadways. 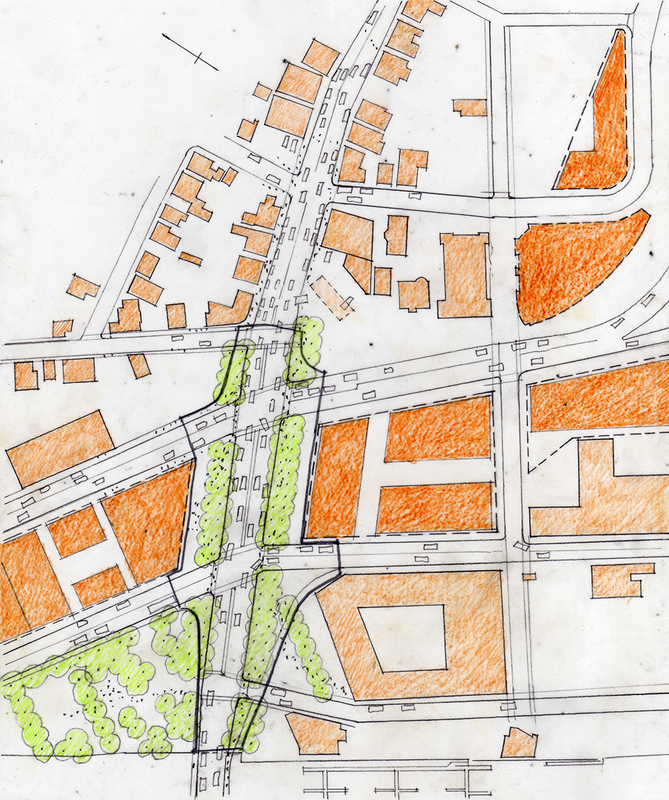 This is the first of a series of posts we will be doing about the 195 Street Grid. To view all the posts and more information, please visit our 195 Relocation Project page. Does the opportunity still exist to make changes to the plan? In practice, until the pavement is actually laid, we should be trying to influence where it is laid. To echo Jef — the RIDOT folks seemed to me to be pretty resistant to significant change to the plan. Their chief focus being to facilitate traffic on and off the highway, possible traffic congestion extending into Davol Square, and designing for peak traffic. My impression is that so much as I think everyone at the meeting wanted to see the South Water feeder lanes adjacent to Corliss eliminated, RIDOT sees those as non-negotiable, except perhaps to realign them slightly. They’re using those 2 outboard lanes as traffic stacking areas to feed 195 East bound because of the No Turn on Red that will remain at that intersection. Of course, if they alight the traffic at a standard angle and are only allowing straight through traffic from South Water, there would arguably be less need for the No Turn on red and traffic stacking. I’ve been waiting for the plans to finally be published in order to do my own analysis and commentary, thanks Jef for staying on top of this! Great post, and some great common sense solutions to the potential mess that RIDOT caused. If they go through with wide streets and useless public spaces, it’ll be a huge opportunity squandered. Then again, these are common sense solutions, but in general, RIDOT lacks common sense. Agreed that this is a great post, but it’s only the beginning on this issue. Does anyone really believe that drivers will obey the 25 mph speed limit with these proposed highway-like streets? Anyone that does is delusional. It’s as if RIDOT is anticipating future road widenings and bridge replacements. It looks a lot like what’s been done to downtown Stamford or most western and southern cities. What’s with the pedestrian island down the center of Wichenden? Unless the island is barricaded by Jersey barriers, it would be a pretty uncomfortable walk with cars whizzing by on both sides. I suppose this is their hip take new kind of pedestrian experience. Who would ever walk down that thing? City and state advocacy groups, city hall, citizens, digital and print media need to band together to prevent this from being buit in its present form. Since the beginning of this project and in particular since last summer when the I-195 land-use RFP was announced there has been enormous pressure to get the project done as quickly as possible and to limit or restrict commentary or discourse that could slow it down. Much of this is about the State getting its way and benefitting from the sale of the new parcels exposed by the removal of the old highway. None of this is new. Other than minor details, such as, curb neck-downs or street trees these street designs are the same as they were last summer, when RIEDC issued RIDOT background maps of the proposed 195 district for the RFP. These street designs are straight out of the highwayman’s playbook. It’s tragic. This has to be fought!!! It must be organized!!! 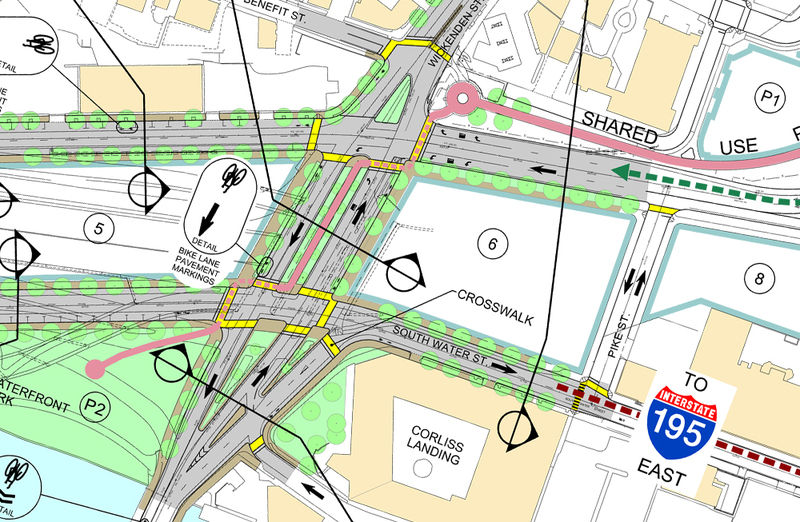 You guys have all of the arguments about the cars, but can I just say as someone who is on his bike quite a bit that RIDOT *Really* loves to think that what a cyclist wants to do is get off their bike and walk every other damn intersection. I especially like their continued suggestion that cyclists walk across the Red Bridge while it is under construction. I guess if you tre training for a triathlon you would want to stop riding and walk the mile and a half span. I think RIDOT executives, all of them, should be mandated to use non-auto transportation at least 25% of the time so they can learn that their token gestures towards cyclists and pedestrians actually make things worse. And also maybe they would understand a little more about RIPTA. “Fox Point residents, meanwhile, have voiced concerns about the size and look of the Wickenden Street intersection. Painter, of the city Planning Department, says that the DOT and the city are working to address them in time for the next neighborhood meeting. A lot of good, solid thought went into that post — in stark contrast to the superhighway approach of the RIDot “plan”. I walk through the Wickenden/Point St. frequently and its current unfriendliness to pedestrians, cyclists and even motorists is remarkable. The proposed grandiose one-block long Dual Carriageway is hilarious as a concept, a nightmare if executed. Come to think of it the pedestrians are what’s ripe for execution. As pointed out, incoming traffic (missiles) need to be slowed down, not given a grandiose, if truncated boulevard as a welcome to the village-like Wickenden area. Worth noting (perhaps snarking at): Providence has a habit of one-block streets. Among my favorites: the three-block combo of American Express Plaza, Finance Way and Park Row West, and the imposing sounding Avenue of the Arts which is just a circle around a fountain(?) in front of the Renaissance Hotel. Anyone thinking to trust RIDot and the city to know how to make walking easy should try to get from the Westin to a Providence Place entrance. Trying to walk into Providence Place from almost any side is a challenge — just watch out for the cars as you sneak in through the garage entrance. Similar pedestrian challenges are designed into into the Whole Foods mall on North Main Street. Hey, no problem, just use McDonald’s drive in lane. So we’ve got a fight ahead of us. Jeff’s offered a lot of ammunition. At their presentation of the current plan RIDot sounded as if they and the city had worked night and day to arrive at their plan, and that there was simply NO OTHER WAY… but of course they were completely willing to listen to comments. If ever there was a time for neighborhood associations and businesses and the people to make some noise. The re-location of I-195 is a priceless opportunity to maintain the character of a wonderful neighborhood — Wickenden Street — or destroy what so many of like about it. 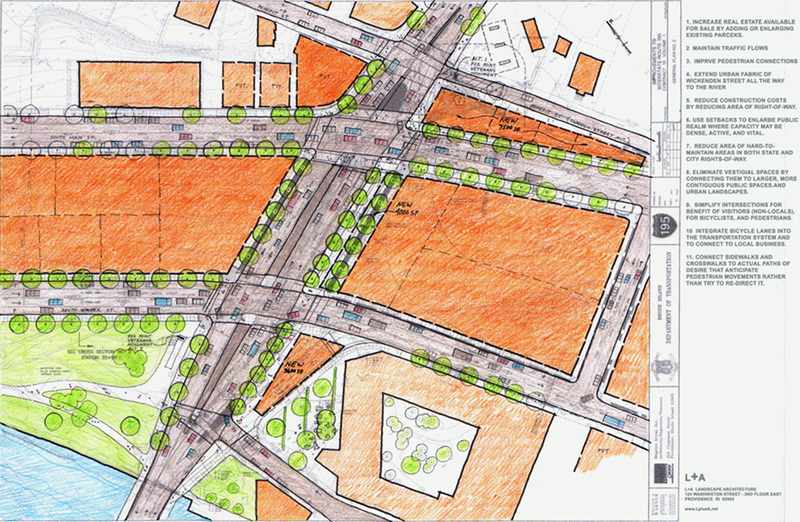 I received a letter from the Planning Department stating that they have instructed RIDOT to look at this plan, and a similar plan proposed by Russell Preston and come up with one or two alternatives to the RIDOT proposed Wickenden Street intersection. A public meeting will be held in early September (time and place to be determined) for the public to review and comment on these new alternatives. Based on that meeting, RIDOT will then move to begin final engineering. Both of the proposals don’t make any sense to me, no offense, Jeff. The South Main/Wickenden and Benefit/Wickenden Street intersections are WAY too close to each other. Why not make the highway off ramp go to Benefit Street, straighten out South Main Street and also straighten out South Water Street to form an ACTUAL grid system with even sized proportional land plots? It seems as though the city just finds complex solutions for simple problems. There’s no need to make the streets anymore confusing -this is a once in a lifetime opportunity! Thank you very much for this clear articulation of the issues. As someone who lives on a side street between Benefit and South Main, I am absolutely SICK TO DEATH of all the cars and especially semi-trucks hurling down South Main at breakneck speeds. In addition to being incredibly unsafe at the end of our streets, in our neighborhood, they also hit potholes, crash to the ground, creating deafening decibels of sound! When is the city going to force these drivers to slow down and realize they are using my neighborhood as a highway? Also, when is the city going to smooth out the pavement so things are quieter from that perspective? I am relatively new to Providence and continue to be shocked at how little the quality of life of the residents’ seems to be considered. The work on rebuilding the streets in the 195 Land should start soon (“spring” is what I’ve been told). I believe some nearby roadways, such as parts of South Main will be repaved at that time as well.